One of the best opportunities of taking a year off to travel is that we have the chance to visit so many places, and sometimes off the beaten track places that are part of few vacation plans. We wanted to go to the rural Midwest; we wanted to see some of the big agriculture that feeds the world, and most of all we wanted to see family. I last visited my Great Aunt Bea when I was sixteen years old; it had been too many years since I had seen her. My Aunt Bea is the most wonderful and inspirational woman. At ninety-two years old she is witty, funny and entertaining. 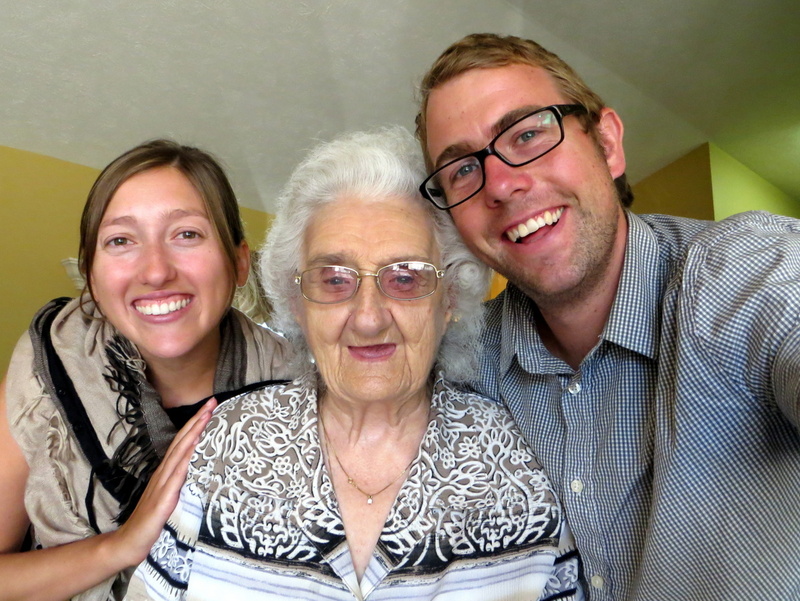 She delighted us with conversation and guided us through the Nebraska countryside. She is an unstoppable woman, and very easily kept up with the two of us in the humid heat and all the activities we could fit into four short days. So, we found ourselves in Grand Island Nebraska, the third largest city in the state with a population of 50,000 people. As expected with a town this size people tend to know one another; and everyone knows Aunt Bea. Bea taught elementary school for forty years. She devoted herself to the children, their families and the communities around Grand Island. Everywhere we went, the people wanted to talk to Bea. My favorite was a woman walking with a cane through the local farmers market. She pauses, recognizes Bea, and then lights up with joy. They recount the story of the fourth grade class that they shared together with Bea as the teacher and then the woman informs us that she just had her eightieth birthday. Bea was teaching fourth grade in 1941! Bea, Carmen and I explored the local farmlands with our informal historian as our guide. The little Fiat we rented stood out, but we had fun zipping around and between corn farms. Corn is king in Nebraska. 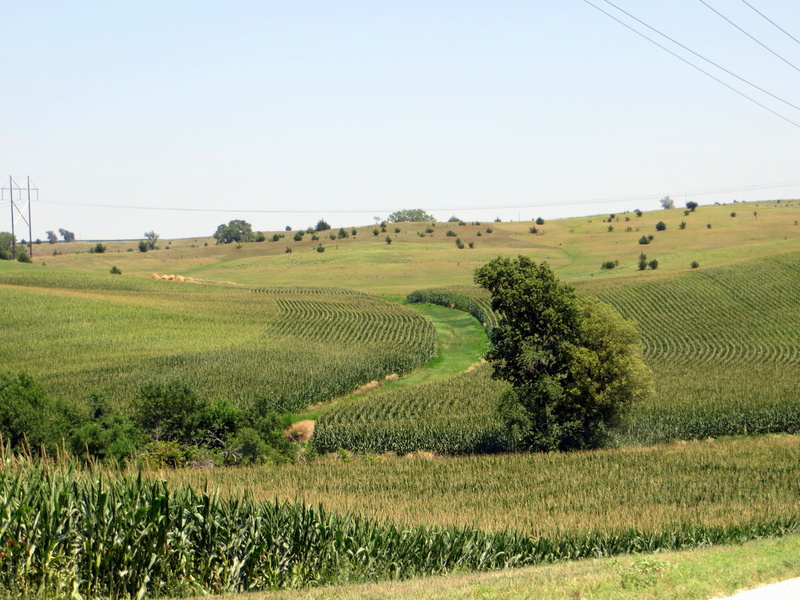 The fields of corn extend for miles and to the horizon in all directions. 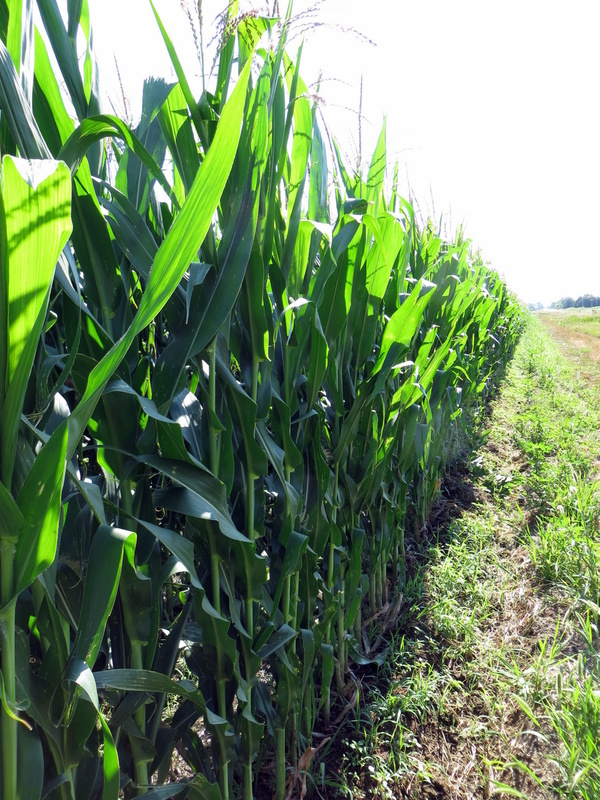 The corn can get very tall too; at seven feet tall the irrigated farms already had what, to me, looked like an amazing crop. The farmers that were not irrigating, well, their three foot stalks were dwarfed by comparison. We meandered through the Grand Island county fair petting the sheep and calves. Bea took us for a walk in Cairo, a kolache in Dannebrog and a drive through St. Libory and Wood River. In each place we learned about the history of the town, the people she knew and the memories she had growing up and teaching in these areas. My favorite of the small towns was Dannebrog. At three hundred people they have been named the Danish capital of Nebraska. 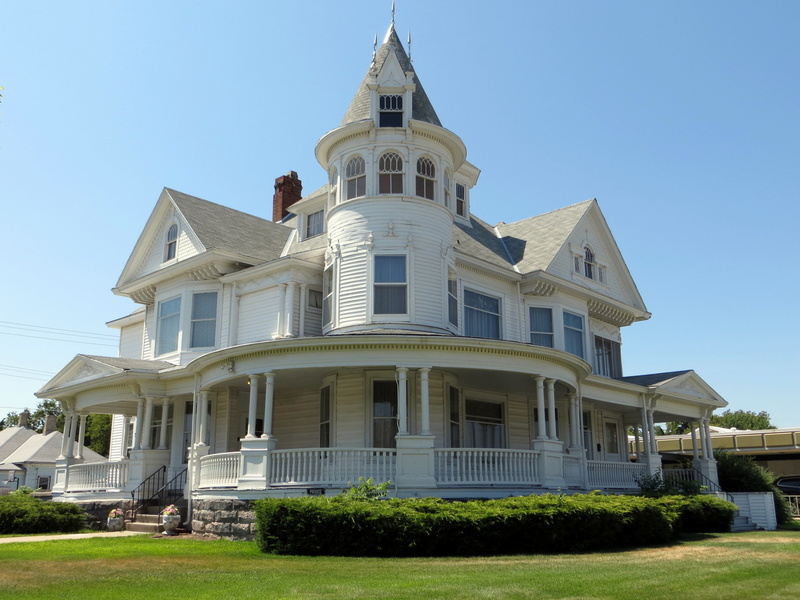 The town is small and picturesque with hundred year old ranch homes, a mill and silos that tower on the town’s edge and people that are friendly and welcoming. We liked it so much that we came back for a second trip. One restaurant is named the Danish Baker. On Thursdays they put together a one-of-a-kind pizza. 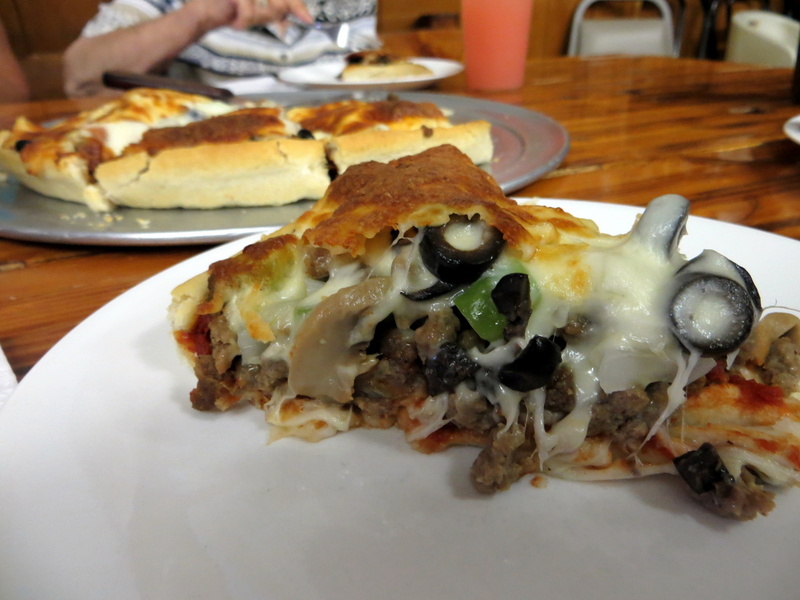 The pizza here is more of a pie, but not like a Chicago pizza, but a pie stuffed with inches of meat and veggies and encased in thick cheese as an attempt to hold it all together. On slower nights the owner will come out to the main dining room to play his guitar and sing folk and rock songs. One of the most exciting reasons for returning to Dannebrog was the chance to see another one of my Grandma’s sisters. Merna and Paul welcomed us into their home, enticed us with heaps of cookies and engaged us with family history that I never knew. 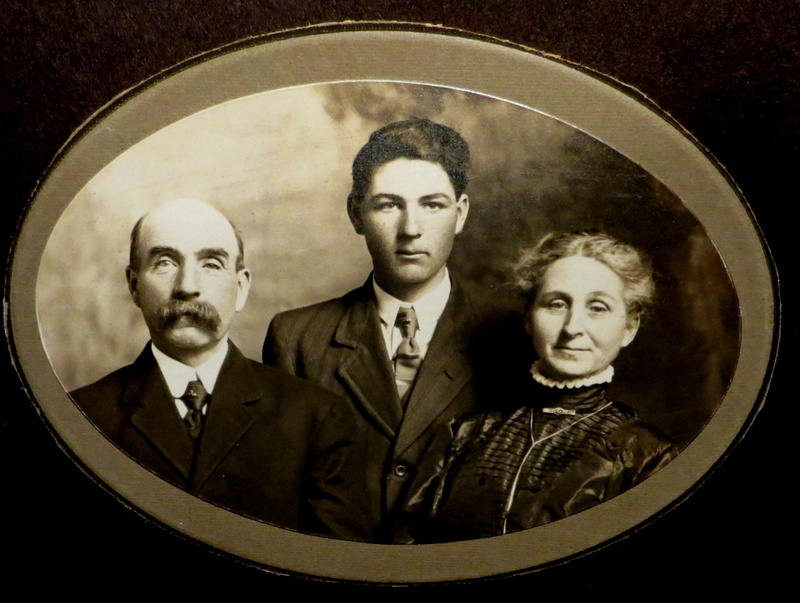 It turns out my great great grandparents arrived from Scotland to start their family and farming in the fertile lands of Nebraska. My family tree is complicated, too complicated for me to even understand. A succession of divorces and re-marriages separated my grandmother from her roots in Nebraska. 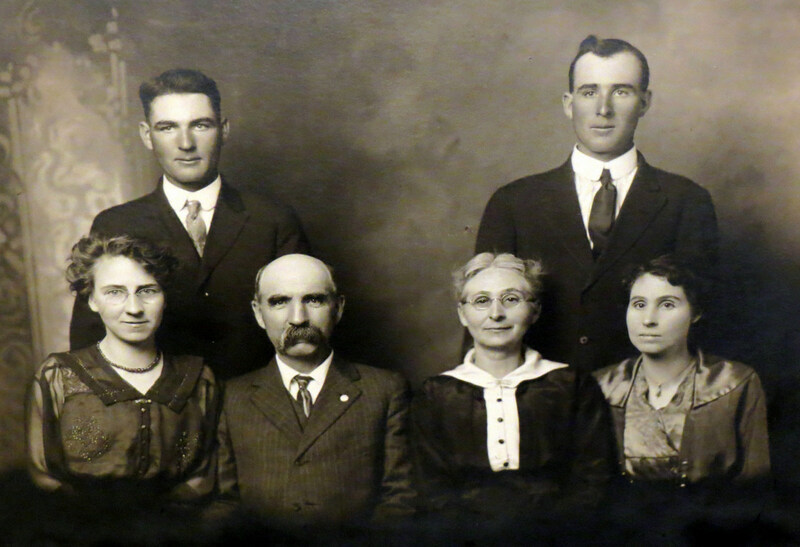 Decades went by without contact, but over the years we have reconnected and rejoined the relatives that have lived in Nebraska for five generations. Give back and help others, because no one got where they are at without receiving a helping hand. I can handle it, I’m tough. I’m a country girl. Oh, I could have stayed out later, but I saw that you were getting tired so I thought we better head back. At night we camped at a regional park on the edge of Grand Island. 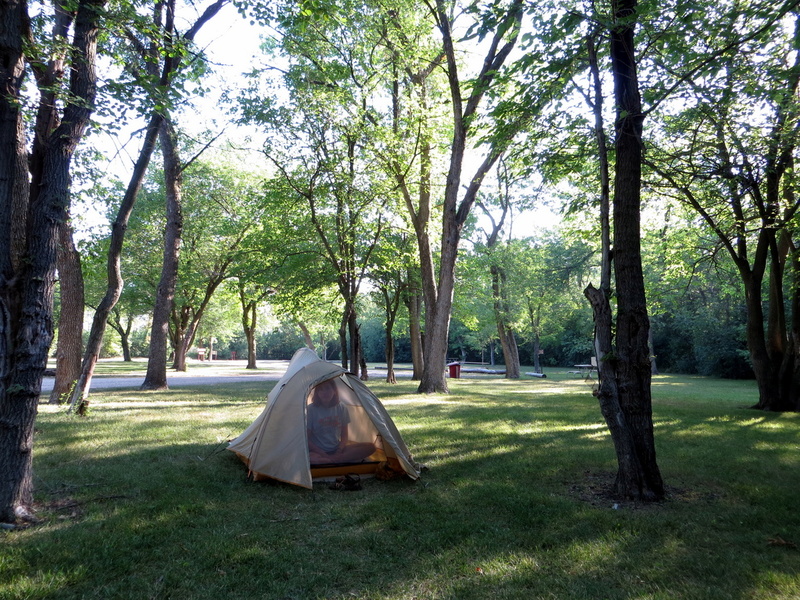 We were surrounded by swaying green trees and soft grass to place our tent. 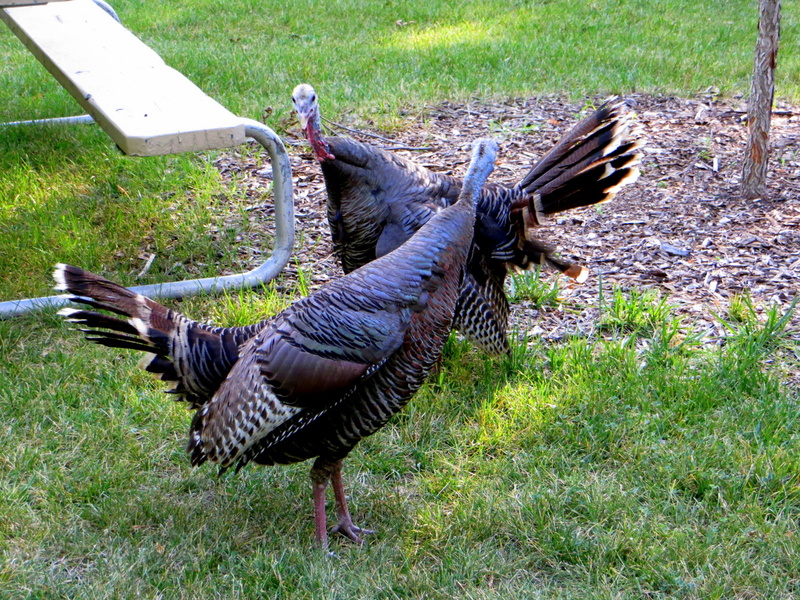 In the morning we were woken up by flocks of wild turkeys that weaved in out of the brush gobbling and pecking at one another for territory. The drive back to Omaha was sad. 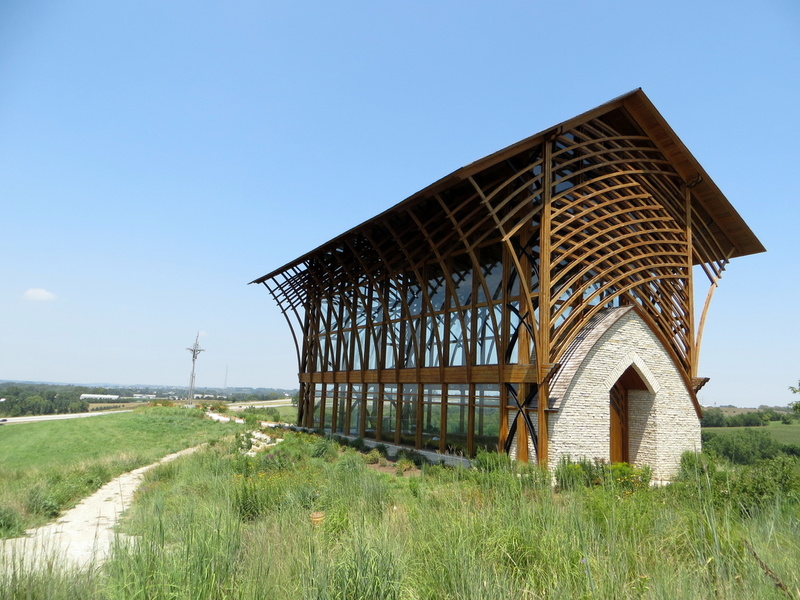 We found this beautiful church on the side of the road, but the architecture was less exciting because we missed Bea. We missed all of her stories and the cheeky, prudent and generous personality that we love so much. Who knows when we will be back in Nebraska. It is an emotional feeling to see family that we so deeply love. The memories here were different from other trips, but most of of I learned a little bit more about myself through the stories and experiences of my relatives. Yeah, I would not call those four bees stings in one year “influential,” but I keep thinking I have learned some lessons. I loved this post. Thank you. I am from Kearney, about 40 minutes from Grand Island, and your picture of the Women’s Club House brought back so many memories. My mom grew up in GI and we had all of our family events in that beautiful building. Your Aunt sounds like so many lovely ladies that call this area their home. In searching for blog posts and writers regarding Nebraska, I am finding little other than us being a place where someone is stuck on their way to somewhere better. One blogger in fact, had some very unkind things about all of the towns she stopped in on her journey through our fair state. Thank you for showing the world a glimpse into Nebraska’s rich heritage, culture and wonderful people. There is a lot more to us than corn, cows and football. Again, many thanks and beautiful pictures. Thanks! I found quite a few blogs this morning that didn’t have the sweet sentiments for Nebraska that you do. Of course, that spurred me to stand up and defend us. I am still working on that one, and hope to publish tomorrow. Too bad there aren’t more people like you, who see us for what we were, are and can be. Look me up next time you visit Aunt Bea. I’ll meet ya at the Women’s Club House in 45 minutes.